For the past 23 years we’ve been keeping sewers and drains running helping you to start to feel human again. We started from scratch but have grown as a business to the point that we can now deal with any problem. And we do. We don’t pretend to be what we’re not We’re not a fancy company . Our business is dirty and pretty much stinks. But we do a damn good job. We’re helping the world be cleaner and smell better! When we do our job well you be able to tell the difference. Anytime there’s an issue with sewage or drainage we’ll call out immediately to clean and repair. And we clean all consecutive tracks. Think of us as your hired heroes that do the dirty work for you. Companies, municipalities and residential owners all order our services. We solve around 4,500 problems with sewage every year and we’ve already helped over 12,000 satisfied customers. The customer is always right for us. And that’s why we receive a minimum of complaints. But if there is anything you’re not happy about we’ll do our utmost to resolve your issue. 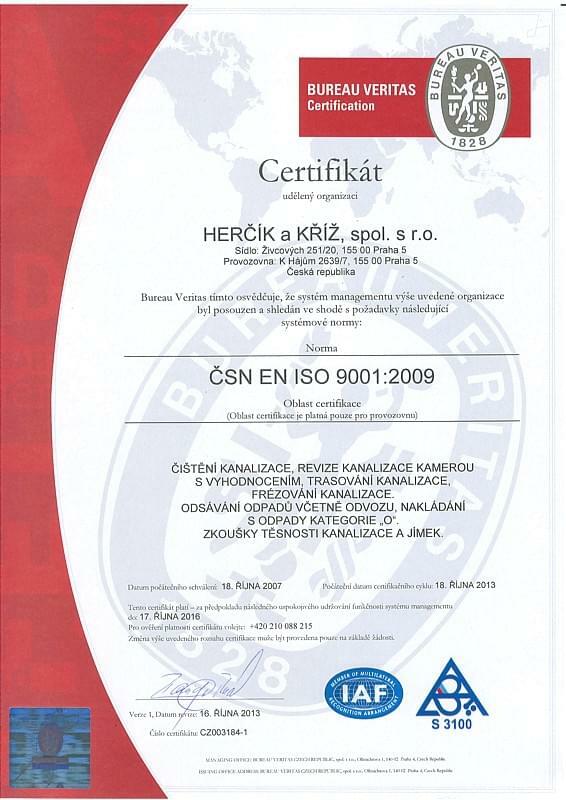 To maintain our standards we are accredited with quality system management ISO 9001. We don’t keep anything hidden from you and we’re not just talking about the dirty work. Just take a look at our pictures and videos from some previous call-outs. And because we don’t sit around doing nothing, we’ve written down , 7 reasons, why you should choose Herčík and Kříž for any issue with your sewage. We’re among a small group of companies, in the Czech Republic that provide comprehensive sewage services. And it’s all down to our technical equipment, experience and abilities. We resolve all sewage problems regardless of the level of difficulty. Did we mention we do it unbelievably fast too? And because we started from scratch, we’ve learned the hard way. Jan Kříž and Stanislav Herčík are a couple of heroes that started with a loan, built their first rinse machine and launched their business. Jan was the one with the experience of sewage cleaning for former Prague water mains and sewers and Stanislav added an enterprising spirit. This was 1993 in the wake of the dissolution of Czechoslovakia when Václav Havel became the first president of the Czech Republic. The union of railway workers went on strike for wage increases. The military service was reduced from 18 to 12 months. And Herčík and Kříž founded a 100% Czech company providing sewage and household drain services. "We didn’t have any employees back then. We did the accounts in the evenings, and repair work during the day. We also had to fill in as operators on call." We clean blocked sewage and household drains. We assess your pipeline’s condition and the cause of clogging using our camera system. We suggest a method of repair and prepare a quotation. We repair pipelines by milling, using trenchless technology or excavate if needed. We drain and dispose of reserovirs, grease separators and septic tanks. We perform leak tests of sewers and reservoirs. We supply grating and baskets for rainwater inlets and other sewage components. This is our story. If you want the sewage specialists, choose our services. Better than sending out an SOS write to us or call us. Thank you.